So, uh, sorry that it took me 10 extra days to wrap all of this up. It’s been a bit busy. We spent several days in our new hospital room in the pediatric ward, where the attempts to fix Caitlin’s electrolytes continued, along with the breathing treatments to make sure her lungs were okay. This was about as exciting as you may think it is. Lots of sitting around between supplements and IV delivery, and blood tests to see if they worked. Apparently, part of the problem was that the recipe for her formula was in the computer incorrectly: it was missing her vitamins and salt substitute (her potassium source). We figured this out on the 6th, the same day we were released and sent home with additional supplements, orders for continued bloodwork (which we don’t have to do at Lurie, but in Aurora near her pediatrician), and a new set of pain medication for Cait. We were finally discharged at 5pm on the 6th, into the heart of rush hour. We finally made it home at 7:45 pm. Ugh. We got ourselves as sorted as we could, and crashed. Marie cat missed us. She has been in my lap at every possible opportunity since we got home. Cait’s pain medication schedule meant that I was still up periodically to administer pain meds, but she has basically been resting comfortably. We took her to get her blood checked again for electrolytes on Saturday, and then again on Monday. This time we found out on Saturday that some of them were too HIGH rather than too LOW. Supplements stopped. On Monday they had dropped back down enough to feel okay, but we were set up to re-check today. Mary Robinette Kowal came to our house and stayed with us on Sunday through to Monday, which was a huge, huge help. (She’s an excellent cook, and left us with plenty of leftovers). I cannot thank her enough for that, as well as coming BACK out to our house last night to sit for Cait so that Michael and I could go out for dinner to celebrate our 14th wedding anniversary. Our original plan was to go into Naperville for dinner at Meson Sabika, but Cait barfed just before I got home from work. She seemed okay after a while, so we went to Nat’s on Maple (a local place 5 minutes away) instead. Mary gets double-awesome friend points for taking care of Cait during a barfy period, especially since Cait threw up again while we were out, and Mary handled it like a pro. Cait didn’t have a fever, and kept her meds down, and made it through the whole night without barfing. She was barfy again later this morning, so we’re in wait-and-see mode, as we don’t know what’s causing her to barf (the usual suspects like upset tummy don’t match the timing…). 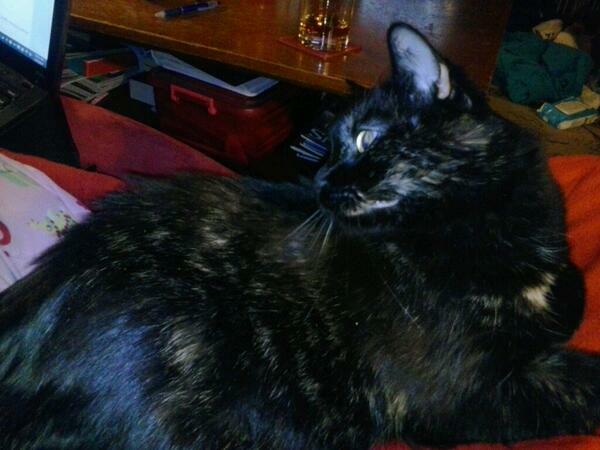 So, the surgical recovery for Cait has been mostly okay. 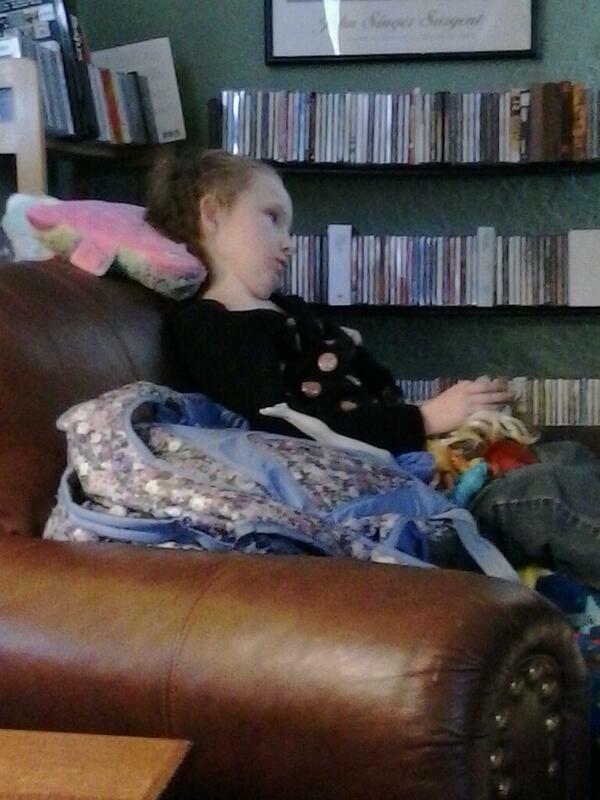 Here’s a picture of her sitting up in a chair watching TV for over an hour. She hasn’t been able to do that for a couple of years. We are all very, very low energy and tired. We deeply, deeply appreciate all of the cards and gifts that have shown up for Caitlin, as well as the meals, the respite, and the well wishes we’ve received. Your support has made us able to be functional. I also want to note (I will post pictures later) that Caitlin received a gift of a new iPad Air from Brownie Troop #4956 Grace McWayne Elementary 3rd graders! Sammi, Stella, Avery, Madelyn, Meara, Clare, Sara, Kyleigh, Gemma, Meredith, and Hanna did a fundraiser at a local pizza restaurant and made and sold crafts to raise money for the iPad to help cheer Cait up after her surgery. We cannot thank them enough for their generosity. I feel like a bit of a broken record saying thank you, but I need to keep saying it, because I don’t know what else to do. We (and I) have been overwhelmed at the response from everyone in helping to care for us during such a difficult time. From the moment we’ve entered the hospital, all the way through March in some cases, people have come out of the woodwork to help out through this whole experience, visiting, giving us breaks, bringing us food. Your support means so very, very much to us through this difficult time. You are living proof that the world is full of good, kind people who care about each other’s welfare. Thank you for proving that to us, time and time again. I’m back at work as of yesterday, doing my best to get back into the swing of things. I’m hoping to be closer to full brain mode in the next couple of weeks as Cait’s recovery progresses. If you are a prayer or kind thoughts person, please also keep Caitlin’s Aicardi sister Annie Tolman and her whole family in your thoughts and prayers. She developed a massive infection in her back and is undergoing surgery twice this week and a big course of antibiotics. Also spare a thought for another of Cait’s Aicardi sisters, Azaria Baker, as she is going through a different scoliosis surgery in Philadelphia tomorrow. Annie and Azaria and Caitlin are of an age, as are all of us parents. We’re thinking of them, and wishing them recovery and care and community as we have experienced here.